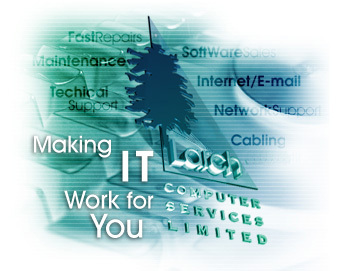 Larch Computer Services has been providing computer solutions , IT support services and computer training to businesses in Bedfordshire , Berkshire , Buckinghamshire , East Sussex , Essex , Greater London , Hampshire , Hertfordshire , Kent , London , Middlesex , Oxfordshire , Surrey , West Sussex & Wiltshire since 1986. Our ISO 9001:2008 Quality Management System (QMS) ensures that all of our computer products and computer services, which include: computer hardware , computer software and computer supplies ; computer networking installations ; computer maintenance & computer repairs (hardware) and virtually all other aspects of computer support and technical support of computer networks, are delivered with a focus on customer satisfaction and continuous improvement. The importance of highly available computers & internet access to businesses has led us to incorporate computer security and internet services as well as the registration of domain names & hosting of websites to our portfolio. 1st Directory 2yi Ally Applegate Biz-King Clush Easyfind Freeindex Gii Hotfrog Hotfrog IT Professionals JTrotta KellySearch Lifestyle LinkPartner Romow Scemes Webotopia World Site Index Hantsweb Computer Networking, Network Directory - Computer networking solutions providers and companies.